If you're familiar with boxing, you know that "bantamweight" refers to a specific size of participant. The same is true of bantam chickens—they aren't a breed, but a scaled-down, or "miniature," version of any breed. Because of their small size and easy portability, they are a favorite among competitors for poultry showing. Bantams generally weigh about half the size of the standard chicken, between 2 and 3 pounds at maturity. When looking for show stock, buy chicks from a reputable breeder. Because you want your birds to appear in full feather during the show, acquire your chicks at the appropriate time. Bantams are shown to best advantage between the ages of 4 and 7 months. 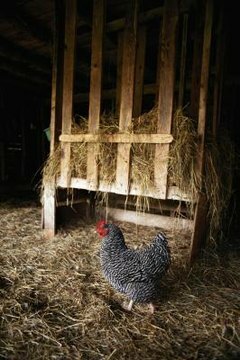 Feed bantams the same high-quality chicken feed that standard chickens eat, just less of it. You'll enter your bantams in classes corresponding to their physical type. Bantam classes are named for the birds' physical appearance. An individual bird shows in only one class, based on breed heritage. These classes include feather-legged, game bantams and those based on combs: rose comb clean-legged; single comb clean-legged and all other combs, clean-legged. Within each class, your bird is judged according to the breed standard. The bird most closely attaining that standard of perfection should win the blue ribbon. You want to teach your birds to "pose" for the judge. Start out by handling your bantams frequently, so they are used to being picked up and held. Show birds shouldn't show fear of people. In order to get your bantams "posing" naturally, the University of Wisconsin recommends teaching a bird to pose naturally by offering little bits of bread or grass on a small stick. At least a week prior to show day, accustom your bantams to their show cage. That way they're comfortable with their cage beforehand, so it's one fewer possible cause of stress. Your bantams must look their best on show day. That involves getting and keeping your birds clean. The day before the show, fill three buckets with warm water for each bantam you're washing. Gently put the bird into the initial bucket, not getting the head wet. Using a small amount of mild dishwashing liquid, gently soap the feathers in the direction in which they grow. Rinse the bird in the second bucket, getting as much soap and crud off as possible. The third bucket provides the final rinse. Towel-dry your bantam and trim toes and beak if necessary; then place him in a cage full of clean shavings. He stays there, with food and water, until you transfer him to the show cage for judging.